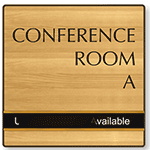 • Made from a 60 mil (roughly 1/16") thick engraved plastic plate recessed within a solid anodized aluminum frame. • Top plate can be easily slid back and forth to signal vacancy, availability, etc. • The top plate is engraved. The base sign is screenprinted and/or coated in vivid color. Looks nice on door, slides evenly and quietly, ease to adhere to door. This is about the 20th sign we have ordered for our office doors. Sign is easy to hang and works perfectly for our needs.